Tahiya Alam and Madison (Madi) McCullough are students on a mission: “To eliminate stigma, promote social justice and help equip other students with the skills and knowledge to live healthier and happier lives, at U-M and beyond." Tahiya's and Madi's campus jobs are as sexual health program assistants in Wolverine Wellness at the University Health Service (UHS). Tahiya is a Master’s student in Human Nutrition in the School of Public Health. And Madi is a senior in Biopsychology, Cognition and Neuroscience, with minors in Women’s Studies Gender and Health, Community Action and Social Change. These experiences have helped shape their career aspirations. 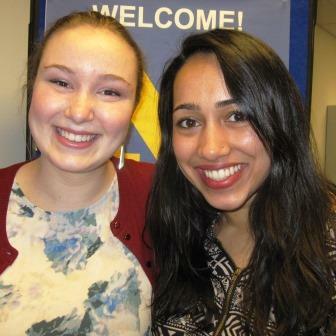 Tahiya explains, “I would like to manage groups and projects, which suits my skills and interests greatly!” And Madi, who entered college aspiring to work in clinical neuropsychology, now plans to attend graduate school for public health and clinical social work. Students can browse all the campus jobs available in Student Life online. We're always hiring!